One of the great challenges of putting together a wine list for a shared plate restaurant with a varied menu is that the wines have to be versatile enough to match a wide array of foods. 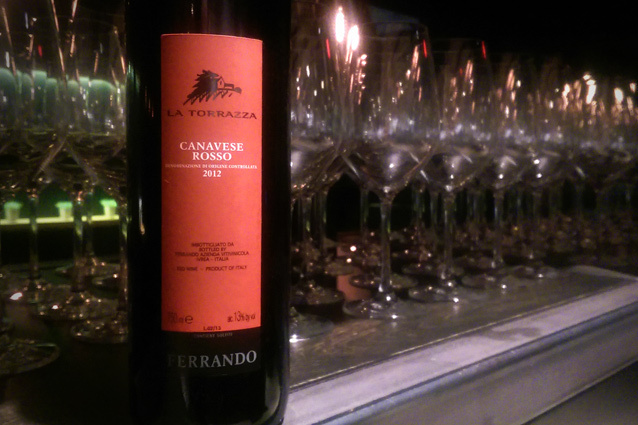 A house favorite at the moment is the Ferrando Canavese Rosso, imported by Neal Rosenthal (New York). This isn’t a bottle typically found in Michigan, but we fell in love with its charms and had a bunch shipped out just for us. In fact, we just found out that we committed to 7.6% of Ferrando’s entire annual production of this wine. And why the hell not? One of the real joys of owning a restaurant is that we can do cool stuff like bring in amazing wine to talk about with our amazing customers. A few geographical facts: Canavese is a small region in the northern reaches of Piedmont, the Italian area known mostly for expressions of the nebbiolo grape from Barolo and Barbaresco. North of Turin, the region is quite close to the French and Swiss borders and is marked by steep, heavily terraced vineyards. Their wines are marked by a fresh, balanced acidity. The best wines will last, but even those seem to be approachable in their youth. Like many of the wines we carry, the Canavese Rosso is made by a small producer anchored in traditional methods, aiming to preserve local grape varieties and characteristics. Luigi Ferrando’s family has been making wine in the region since 1900, and they are also known for working with the local indigenous grape Erbaluce. We highly recommend this wine: It’s great with meats and anything grilled, but it has enough acidity and lightness to avoid clashing with lighter dishes. Also, it’s really damn delicious. Around the time that we were in the early planning stages for the restaurant, we were meandering about Eastern Market one Tuesday and noticed a vendor selling black teas. We struck up a conversation, tasted his wares, and decided on the spot that we wanted to carry his stuff. Joseph Wesley Teas imports and sells some exquisite, single-origin black Chinese tea. In discussing how Selden Standard would serve tea, Joe offered to select some seasonal teas outside his typical offerings for us to feature. He’s planning to help us acquire green teas in the spring and summer when they’re in season and more appropriate oolongs for fall and winter. Among these hand-picked teas is a Da Hong Pao that is on our opening menu. Da Hong Pao (Big Red Robe), the first oolong tea produced, is a type famous for its very complex taste and aroma. These teas come from the WuYi mountains of northern Fujian, arguably the most famous tea-growing region in all of China. The geography and soil of the region are characterized by a red clay in which the prized Qi Dan cultivar grows. It’s this specific variety of tea bush growing in these particular soils that give the tea its distinctive flavor. Oolong teas are distinguished by the method of production: Leaves are hand-plucked and sun-withered then bruised by a tumbling machine or by hand. This leeches moisture from the leaves and begins an oxidation process that produces melanin, a black-red pigment. After a partial oxidation, oolong teas are heated in a pan to “set” the leaves then roasted over hardwood coals. This roasting is unique to oolongs and separates them from black teas. Da Hong Pao are heavily roasted teas, with the process taking up to 20 hours. A very popular type among tea lovers, Da Hong Pao engenders knock-offs: Some say that 99% of Da Hong Pao in the U.S. is not actually made from the true cultivar or is blended with less prestigious teas. Joe personally selected our Da Hong Pao and brought it to the United States just for our restaurant. We think it’s delicious, and we’re pretty stoked to be doing business with him. Selden Standard is also carrying Joseph Wesley Teas’ Dian Hong Congfu, a contemporary black tea from the Yunnan province in Southwest China. This tea is unusual in that it is not made from the subspecies cameilla sinensis sinensis like almost all Chinese tea. Instead, it’s made from cameilla sinensis assamica, the same variety used for Indian Assam and Ceylon teas. Yunnan has soils rich in organic material that produces rich, sweet tea. These characteristics are definitely found in Joe’s Dian Hong, which you can order at the restaurant or buy for yourself.